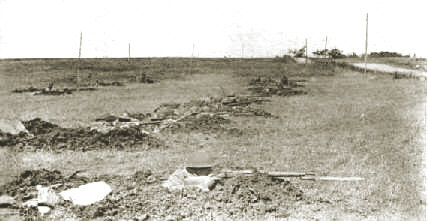 The 1st and 42nd Divisions Attacked Across the Woevre Plain, From Right to Left. Headquarters, United States First Army...became operational on 31 July... When the situation [in the Aisne-Marne] stabilized...Pershing obtained Foch's permission to take over the St. Mihiel sector instead, leaving three or four American divisions on the Vesle under French command. Preparations for the St. Mihiel attack [the first phase of an anticipated thrust into Germany through Metz] -- long planned by Pershing and his staff -- were begun at once. The St. Mihiel salient, which had been formed in the fall of 1914, seriously hampered French rail communications between Paris and the eastern segements of the front. 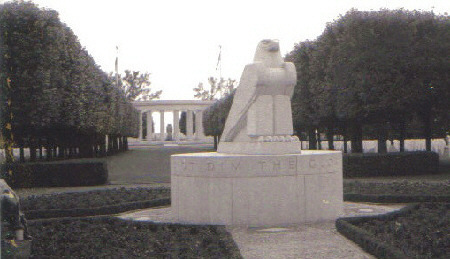 Pershing's First Army headquarters opened in the St. Mihiel area on 13 August. The concentration of troops for the operation began at once. Click here to view a map of the battlefield. 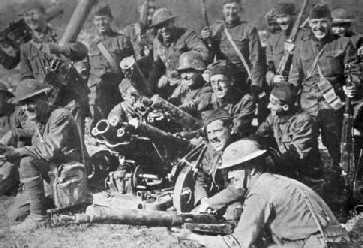 From 12-16 September 1918, on the Western Front of France, one of the most significant battles of World War One was fought, the battle of St. Mihiel. The engagement was the first battle in which American led forces used a concise and comprehensive operations order allowing for independent initiative from their front-line commanders. The American Expeditionary Force (AEF), commanded by General John J. Pershing, faced several German armies who were defending a series of in-depth trenches. 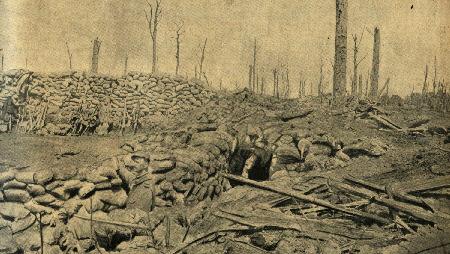 The trench boundaries started in the French fortified area southeast of Verdun, jutting south toward St. Mihiel, and then east to Pont-Au-Mousson. The combat commanders participating in the operation, namely Colonel George S. Patton Jr. and his subordinate officers, believed that by rapidly adapting to a situation and through their personal leadership they could influence events on the battlefield. During World War II, General Patton drew upon these personal leadership principles when he prepared for an attack on the German salient in the Ardennes Forest. Today, the battle of St. Mihiel teaches modern tactical commanders the necessity to issue clear and concise operations orders that allow small unit leaders the freedom to carry out their commander's intent during the battle. By 1918, the number of offensives on the Western Front began to slow down into another phase of static warfare. Although the Western armies outnumbered the Germans, the strategic situation was turning into a murderous war of attrition in which each shattered side could no longer sustain an offensive. Yet, General John Pershing believed that a successful Allied attack in the region of St. Mihiel, the Metz, and Verdun would psychologically break the Germans will to fight. . . Besides, General Pershing knew the AEF's strategic setting dictated that the "clearing" of the rail and road communications into Verdun, and the capture of the German's key rail center at Metz should be the Americans' primary objective. Then the Americans, from their bases [now closer to] the Rhine, could launch offensives into Germany. Tactically, the terrain became the biggest threat to the attacking forces. After five days of rain the ground became almost impassible to both the tanks and infantry. The weather section of I Corps operation order stated: "Visibility: Heavy driving wind and rain during parts of day and night. Roads: Very muddy." Another obstacle to the American operation were the many in-depth series of trenches, wire obstacles, and machine-gun nests that the Germans installed to augment their defensive positions. Therefore, "The Renaults designed to cross six-foot trenches in dry weather, were being forced by their crews to negotiate line after line of trenches that were eight feet deep and ten to fourteen feet wide 'in horrible mud.'" Further, the battlefields' key terrain was control of the villages: Vigneulles, Thiaucourt, and Hannonville-sous-les-Cotes because their rapid capture would ensure the envelopment of the German [divisions] near St. Mihiel. To do this, the American forces would breach the trenches and then advance along the enemy's logistical road network toward their objectives. Although the AEF was new to the French theater of war, they trained hard for several months in preparation of fighting against the German armies. Also, the British use of armor at the battle of Cambrai impressed General Pershing so much that he ordered the creation of a tank force to support the AEF's infantry. 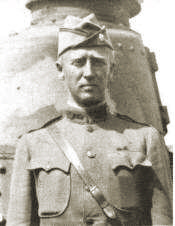 As a result, by September 1918, Colonel George S. Patton Jr. had finished training three tank brigades at [Langres], France for an upcoming offensive at the St. Mihiel salient. Yet, General Pershing's operational planning of St. Mihiel had broken down the salient into several sectors. Each Corps had an assigned sector, defined by boundaries, that it could operate within. The American V Corps location was at the northwestern vertices, the II French Colonial Corps at the southern apex, and the American IV and I Corps at the south-eastern vertices of the salient. Furthermore, General Pershing's intent was obvious, to envelope the salient by using the main enveloping thrusts of the attack against the weak vertices. The remaining forces would then advance on a broad front toward the direction of Metz. 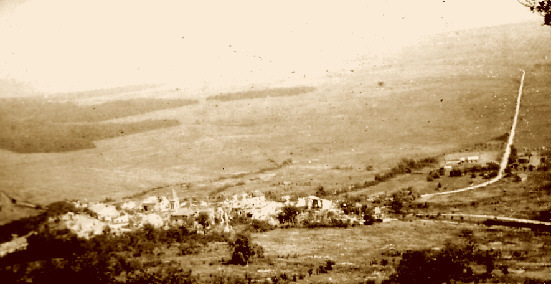 This pincer action by the IV and V Corps was to drive the attack into the salient and to link the friendly forces at the French village of Vigneulles while the II French Colonial Corps kept the remaining Germans tied down. One reason for the American forces success at St. Mihiel was General Pershing's thoroughly detailed operations order. In fact, "...his [Pershing's] total offensive plan ran to only eight pages, about 150 less than the French proposal." Nevertheless, General Pershing's operation included detailed plans for penetrating the Germans' trenches using a "basic" combined arms approach to warfare. His plan had tanks supporting the advancing infantry, with two tank companies interspersed into a depth of at least three lines, and a third tank company in reserve. The result of the detailed planning was an almost unopposed assault into the salient. The American I Corps reached its first day's objective before noon, and the second days objective by late afternoon of the second day. Another reason for the American success was the audacity of the small unit commanders on the battlefield. Unlike the World War One officers that commanded their soldiers from the rear, Colonel Patton and his subordinates would lead their men from the front lines. They believed that a commander's personal control of the situation would help ease the chaos of the battlefield. One example of subordinate leadership was "Second Lieutenant Julian K. Morrison, ...[who] came upon a German machine-gun nest as he led his tanks forward on foot. Struck by two bullets in the right hand, he continued forward and, armed only with his .45-caliber pistol, captured the crew." ( Indeed, Patton's aggressive leadership style seemed to have inspired and influenced several of his subordinates during the battle. 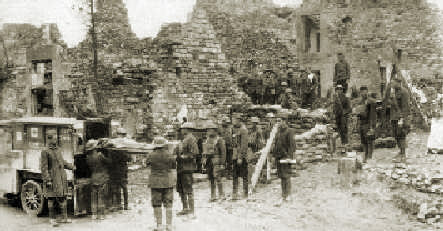 Yet, the hallmark of the battle was Colonel Patton's employment of unsupported tank platoons in a "cavalry-styled" attack outside the [small village] of Jonville. On the 13th of September, the 326th Battalion was southwest of St. Benoit where they were going to link with the enveloping units of General Samuel D. Rockenbach. However, an impatient Colonel Patton did not wait for the meeting. Instead, he sent a patrol of three tanks and five dismounted soldiers toward the [hamlet] of Woel to keep contact with the enemy. "Thirty minutes later the patrol was attacked by a force estimated to be at least a battalion of infantry accompanied by a battery of 77mm guns." Colonel Patton reacted to the fluid situation by sending the defenders a platoon of five tanks. The tanks joined into the fray, and without infantry support, drove the Germans about six miles to the outskirts of Jonville. "During the running battle the tankers killed or put into flight at least a dozen machine-gun crews and captured four 77mm cannon." Thus, Colonel Patton responded to the fluid situation by aggressively committing his "unsupported" tanks. Further, the tanks "cavalry-styled" attack caught the German infantry off-guard and gave the initiative back to the "outnumbered" Americans. In conclusion, the audacious leadership qualities and the operational planning present at the battle of St. Mihiel are still important factors for the modern military commander. Another major factor is the continuation of detailed planning that permits leaders to interpret their commander's intent. General George S. Patton Jr. continued to successfully use those skills throughout his lustrous career, especially at the Battle of the Bulge. Finally, "Had Pershing been allowed to conduct his offensive as planned, The First American Army probably would have penetrated German lines [further] and altered the strategic situation along the whole Western Front." Captain Giese's analysis and other interesting material can be found at the World War I Page of TAC-CP. Hiked through dark woods. No lights allowed; guided by holding on the pack of the man ahead. Stumbled through and under brush for about half-mile into an open field where we waited in a soaking rain until about 10 PM. 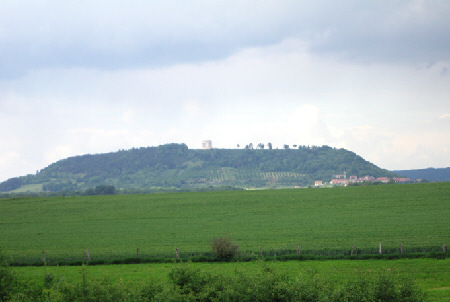 We then started on our hike to the St. Mihiel Front arriving on the crest of a hill about 1am. I saw a sight which I shall never forget. It was the zero hour. In one instant the entire front as far as the eye could reach in either direction was a sheet of flame while the heavy artillery made the earth quake. 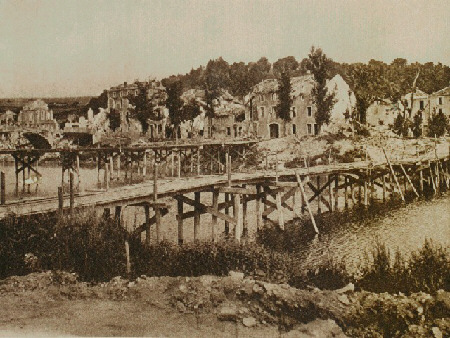 The barrage was so intense that for a time we could not make out whether the Americans or Germans were putting it over. After timing the interval between flash and report we knew that the heaviest artillery was less than a mile away and consequently it was ours. That same night we were advised that the victorious Americans had taken Thiaucourt - that scene of so many of our operations back of the lines...And we were also informed that at last Montsec had fallen! Its high crest dominated the entire landscape......The capture of Montsec was a remarkably fine bit of strategy, for it was neatly outflanked and pinched out with a very small loss indeed. Our infantry and Tank Corps accomplished this feat within twenty hours. A Great Day for the Americans! Our infantry is still pushing 'em back. Many prisoners are going by. We were at guns all morning, but had to stay in camp all afternoon. We are out of range and await orders to move up. Steady stream of men and material going up constantly. Two of our boys sneaked off and went up to the old Hun trenches and brought back lots of Hun souvenirs -- razors, glasses, pictures, equipment, etc.